According to the latest investigation, rotted wood beams were the cause of a balcony collapse that killed six college students in Berkeley California. The students were having a party and many were gathered on the upper floor of a 176 unit apartment building. A probe was launched by the Building and Safety Division into the cause of the collapse. It was noted that the joists that were supposed to be supporting the balconies, which extended out of the side of the building were completely dry rotted. What is the duty of an apartment owner in California to inspect their property and make it safe? 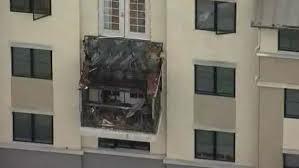 Clearly, this was a advertised and use for residential rental space and the apartment owner would have a duty to maintain the property in a reasonable manner to prevent injury or death. The question becomes, could they have or, more importantly, should they have known about this dry rot condition in time to either warn about it or repair it? “A landlord must conduct reasonable periodic inspections of rental property whenever the landlord has the legal right of possession. Before giving possession of leased property to a tenant [or on renewal of a lease] [or after retaking possession from a tenant], a landlord must conduct a reasonable inspection of the property for unsafe conditions and must take reasonable precautions to prevent injury due to the conditions that were or reasonably should have been discovered in the process. The inspection must include common areas under the landlord’s control. I would argue that if you own a 176 unit apartment building with balconies that jut out of the side of the building and are several stories off the ground, you should absolutely inspect and detect rotted joists well before they get to the point of potential collapse! Dry rot of wood beams does not happen “overnight” and some reasonable inspection could have detected this defect. I believe there will probably be wrongful death claims filed out of this tragedy and claims paid out through settlement. If the matter goes to trial, I would suspect that the California jury instruction cited above will be a key to a verdict. The defense may argue that the condition was hidden and the plaintiffs will argue that there was a duty to inspect and detect the dangerous condition of the property. Our thoughts and prayers go out to the victims in this tragic case!